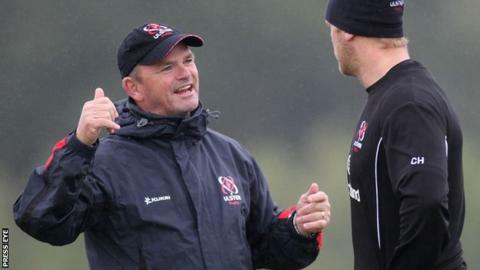 Mark Anscombe is eager to continue as Ulster coach after his contract expires at the end of the season. "I'm enjoying it, we've got some good players and some good ones coming through," said the New Zealander who took charge at Ravenhill last year. "It's a good environment with good people to work with. We're not complete yet in terms of where we need to go but it's a pathway we have started. "And with any job you start, you want to be able to finish it." He added: "You've got to be asked - my job is to just put out the best team and achieve success. "If the players do that and I do that people want you to stay around." The former Auckland coach guided Ulster to the Pro12 final last season while the Irish team currently sit top of their Heineken Cup pool after three wins from three games. If Anscombe does stay, he will have to find replacements for props John Afoa and Tom Court, who are set to leave Ulster at the end of the season. New Zealander Afoa is joining Gloucester while Irish international Court has agreed a three-year deal with London Irish. "When you lose players of that calibre, you are disappointed," said Anscombe. "We are not just losing quality players, they are quality men and they will be missed in more ways than one. "It's fortunate that with both of them their focus will not change in the next six months, to help us achieve what we want to achieve."